Thu., July 12, 2018, 7:39 a.m.
BRUSSELS – In a chaotic 28 hours at NATO, President Donald Trump disparaged longtime allies, cast doubt on his commitment to the mutual-defense organization and sent the 29-member pact into frenzied emergency session. Then, in a head-snapping pivot at the end, on Thursday he declared the alliance a “fine-tuned machine” that had acceded to his demands to speed up increases in military spending. Trump claimed member nations had agreed to significantly boost their defense budgets and reaffirmed – after days of griping that the U.S. was being taken advantage of by its allies – that the U.S. remains faithful to the accord. “The United States’ commitment to NATO remains very strong,” Trump told reporters at a surprise news conference following an emergency session of NATO members held to address his threats. There were no immediate specifics on what Trump said he had achieved, and French President Emmanuel Macron quickly disputed Trump’s claim that NATO allies had agreed to boost defense spending beyond their existing goal of 2 percent of gross domestic product. Painting a rosy portrait before he left Brussels, Trump added: “I can you tell you that NATO now is a really a fine-tuned machine. People are paying money that they never paid before. They’re happy to do it. And the United States is being treated much more fairly. With that, Trump moved on to the United Kingdom, where significant protests against him were expected. Although Trump administration officials point to the longstanding alliance between the United States and the United Kingdom, Trump’s itinerary in England will largely keep him out of central London, the center of the protests. Instead, a series of events – a black-tie dinner with business leaders, a meeting with Prime Minister Theresa May and an audience with Queen Elizabeth II – will happen outside the bustling city, where Mayor Sadiq Khan has been in a verbal battle with Trump. 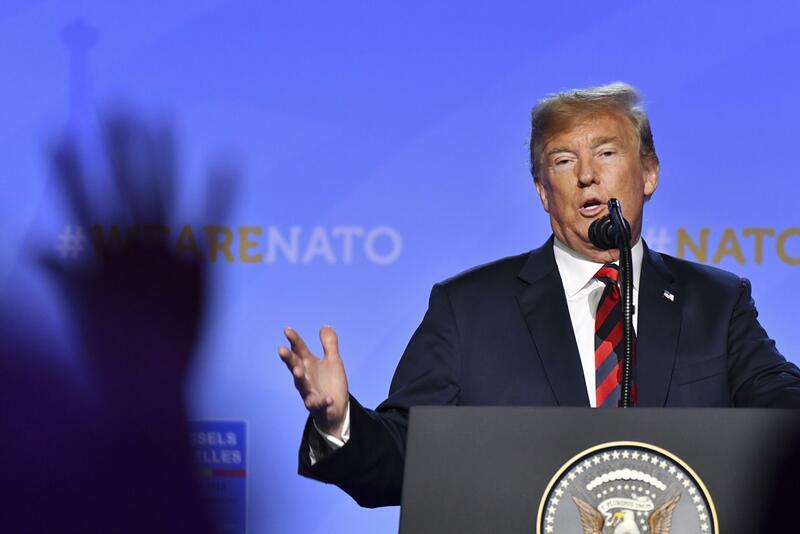 At NATO, Trump did not specify which countries had committed to what, and it remained unclear whether any had changed their plans. He suggested an accelerated timeline, saying nations would be “spending at a much faster clip.” That would mark a significant milestone for the alliance. Macron, in his own news conference, seemed to reject Trump’s claim that NATO powers had agreed to increases beyond previous targets. He said the allies had confirmed their intention to meet the goal of 2 percent by 2024 and no more. The emergency session came amid reports that Trump had threatened to leave the pact if allies didn’t immediately up their spending. Officials said no explicit threat was made. Trump tweeted that NATO countries “Must pay 2% of GDP IMMEDIATELY, not by 2025” and then rattled them further by privately suggesting member nations should spend 4 percent of their gross domestic product on defense – a bigger share than even the United States currently pays, according to NATO statistics. Published: July 12, 2018, 7:39 a.m.